When you think of British hardman Danny Dyer, games probably aren't the first thing to spring to mind, but Bethesda's upcoming first-person shooter Rage 2 may change that. The company has announced a special, free voice-pack for Rage 2 featuring the soothing tones of Danny Dyer. Activating the Diamond Geezer cheat code allows players to enjoy Dyer mentoring them by offering advice on "motors", "shooters" and "mobs". The Diamond Geezer cheat is just one of the free Rage 2 cheats that will be made available to players. Others include the 'He's on Fire' cheat which sees NBA Jam's Tim Kitzrow commentating the game and 'Git Gud' which sees every enemy going down in one hit. In addition, Bethesda has promised more cheats will be dropped into the game on a rotating basis, and additional cheats will be added to the lineup post-launch. But how can you access Rage 2 cheats? 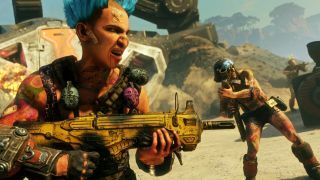 According to Bethesda, the Rage 2 Deluxe Edition comes with three cheats right off the bat. But while these cheats will be accessible to anyone with any version of the game, those without the Deluxe Edition may have a bit more legwork to do. "Cheats are given to you by the Wasteland Wizard," senior gameplay programmer Peter Hastings explains on Bethesda's official blog. "He’s a mystical sage with universe-altering powers, who can be found wandering the wasteland." The Wasteland Wizard will sell players cheats for in-game currency (if you can find him), so you don't have to actually pay real-life money for extra cheats.